There's no doubt the guy was non-compliant. And there's no doubt he was drunk. But there's also no doubt that he wasn't presenting any danger to the officer or that the officer had many other options besides knocking the man off of a moving lawnmower with 50,000 volts. But hey, there's nothing funnier that seeing a drunk man screaming in agony and fouling his trousers because he's just been shot full of electricity, so it's all good. I laughed so hard I cried. A former Southern Virginia University and Brigham Young University adjunct professor of political philosophy and jurisprudence, Dr. Lowery entered the Utah Third District courtroom alone on November 22, 2004, to make oral argument before Judge Anthony Quinn. Two Salt Lake County Deputy Sheriffs sat at the back of the courtroom, one on each side of the door. Other deputies were in the foyer of the courtroom. No members of the public were present. Dr. Lowery suffered from major depression, bipolar disorder, paranoia disorder, delusional disorder, and psychotic disorder. Judge Quinn granted one of Dr. Lowery’s motions made under the Americans with Disabilities Act, Title II, which allowed for reasonable modifications of court rules, policies, or practices in order to accommodate Dr. Lowery’s multiple mental disabilities. Judge Quinn interrupted him with ordering the bailiffs to take Dr. Lowery to a holding cell. A split second later—unclear whether following the judge’s orders or acting on his own accord, a bailiff sent 50,000 volts of incapacitating electricity into the lower back of the unsuspecting professor. As the courtroom video shows, nothing in Dr. Lowery’s behavior suggests that the bailiffs had any reasonable motive to believe they or the judge were in physical danger. Yet the taser gun fired more than once. The repeated electric shocks blew Dr. Lowery over the podium, and he landed face down on the floor, with two bailiffs on his back. The electric blasts caused Dr. Lowery’s bowels to empty twice. He screamed, “Help me!” while he complied with a bailiff’s order to stay on his belly, neither capable nor willing to offer resistance. Then, suddenly, he went unconscious. Remembering they were still on camera, the bailiffs shouted at Dr. Lowery to not resist again (though his resistance was only instinctive) and threatened him with more electrocution. When they realized that he could no longer hear them, they dragged the man across the floor, put him in a chair, and massaged his heart. One bailiff called for paramedics. Since no one but the victim and the abusers were in the courtroom, this crime remained unknown to the public until recently. A mentally ill man, causing trouble in a courtroom. C'mon. They had to do something, right? Here's the Youtube of the event. The government tortures innocent citizens into unconsciousness, on camera, in United States courtrooms. They use them on prisoners and on motorists and on political protesters and on mentally ill people. Why on earth would any of us think they wouldn't torture terrorist suspects? In fact, the wires on the man above weren't actually attached to anything. Those men in those videos were actually electrified. 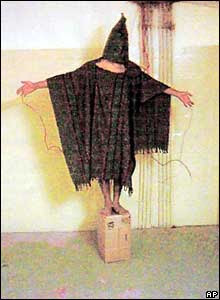 America's torture problem is much bigger than Gitmo or the CIA or the waterboarding of Khalid Sheik Mohamed. The government is torturing people every day and killing some of them. Then videos of the torture wind up on Youtube where sadistic freaks get their jollies watching them. It's sick. Update: If you are interested in the good, western, democratic societies' long history with electric torture, read this instructive essay.I'll be writing more about it in the future. Update: the video of the man on the lawnmower was evidently staged. That's entertainment. The other one was not.